Career, in its early definition referred to a well worn path taken by an object or person, perhaps daily. There did not have to be purpose or meaning in the routine event, only that it be done regularly. For most that provides a basic level of understanding for a chosen endeavor, career ‘path’ or job classification. Although I would say this can be done at two levels. (1) YOU DO YOUR JOB: Tasks are done with a personal awareness – in this case to please your employer and make a buck or two, and then secondarily (2) A JOB WELL DONE MATTERS: Your daily routine is done with awareness of those around you and you do it as a member of a community of people … ie you do it well with compassion and justice for neighbor whether they be customer or fellow employee, with give and take and neighborly love and care. The second consideration here is Calling. Calling can only be done on the foundation of a career. Knowing a job and knowing what it is to do it well. Calling is best understood as the motivator beyond self that gets a person out of bed in the morning and helps them internally return to a job day in and day out. This can often be (and is best) understood in the context of their being a “Caller” – an active Creator/God/Force who has ordered and is ordering the universe towards a greater purpose or direction. (1) GOD IS THE CALLER / WE ARE THE WORSHIPPER – At the primary level it is an understanding and acceptance of the knowledge and reality that the individual is uniquely gifted for a task and role in society by God and that only he/she can fulfill that role. (2) WE DISPLAY GOD’S CHARITY/CARE AS GOD DOES IN OUR WORK – At a secondary level it is the knowledge and awareness that the individual is working in a broader network of individuals also uniquely called by God to similar ends and purposes in human history, and that part of the individuals role is caring for those individuals as a means or way for God to dispense mercy and justice in the world. From a theological understanding this calling can be almost directly related to the idea of the GREAT COMMMANDMENT where when asked how to sum up the law Jesus said that the law is summed up in these two truths. Love the Lord your God with all your heart, soul, mind, and strength … and Love your neighbor as you would love yourself. The first part allows our work (in itself) to become a scattered type of worship where we do our work knowing that God is watching, and it is done well because we do it for and unto Him. The second part is that work done as worship is done for neighbor as an expression of charity …. 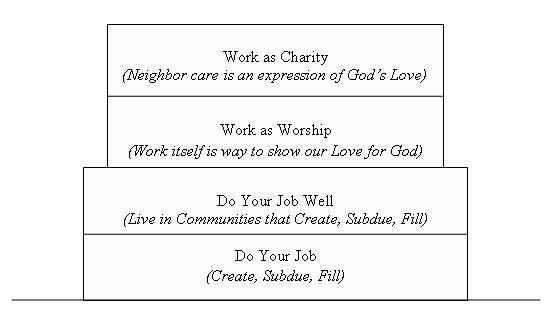 Because we have been treated and loved well by God we can treat our neighbors well in our work. Rather than facing deals as win lose propositions we earn a fair price and sell at a fair price, always thinking of (and treating fairly …. As we would want to be treated) the other stakeholders in any transaction or work endeavor. This brings us to the notion of a profession or professions. Rightly understood professions have always required some sort of formal education as well as a testing or formal acceptance by a group of peers. I say rightly understood for this reason, professionals are ones who are capable of bringing others along and hold wisdom that is worthy of being shared within specific vocations as well as special knowledge of what calling looks like in those careers. Is a person in the chosen profession just for themselves or others, can that be seen in their actions. Do they understand the proper tensions and skills involved in every career. Professionals share wisdom, examine and even ‘ordain’ others into a chosen field. This my be formal or informal, but it flows out of the idea of mastering a skill, knowing who to properly dispense that skill at an individual and societal level and then being in a position to catechize and teach others in that same skill … a willingness and ability to have apprentices. The two levels that this is displayed at are (1) SPEAKING THE TRUTH – At the individual level, understanding ones profession enough to not just master the task, but formally being examined to speak and instruct knowledgably, and then (2) BRINGING ALONG OTHERS – Developing and instructing apprentices in a field of study or skill that move up the hierarchy to one day fill the shoes of the master teacher. From a theological standpoint this is the idea of the GREAT COMMISSION played out. Can you be ready to speak give a word to the reason why you do the things you do, a word of testimony as to your internal motivation for your job skills and profession. Have you been instructed in this area and mastered an understanding of the basics as well as internal struggles in any position. Secondly, do you have disciples that you are building into and bringing along. Are you readily recruiting and caring for others as a master teacher who understands the full spectrum and is willing to share skill, motivations and your own internal struggles in a life giving way for the sake not of yourself, but instead of the profession. Do you embody the reality of the profession? Often these issue and dimensions are worked through in a developmental pattern, each of which gives rise to new issues. The questions of who am I, How do I therefore relate to others are foundational (career issues) secondary issues include ideas of How should I relate to my creator, and what is my unique role and place among a broader community (calling issues), and then finally questions of leadership .. what type of legacy do I want to leave, how should I communicate this and who am I bringing along in the next generation (profession issues.) Turned on its side the pyramid can be represented along this spectrum. Because of the discipleship and mentoring in work/faith integration can and should be treated as a process, with early developmental efforts focusing on career issues. 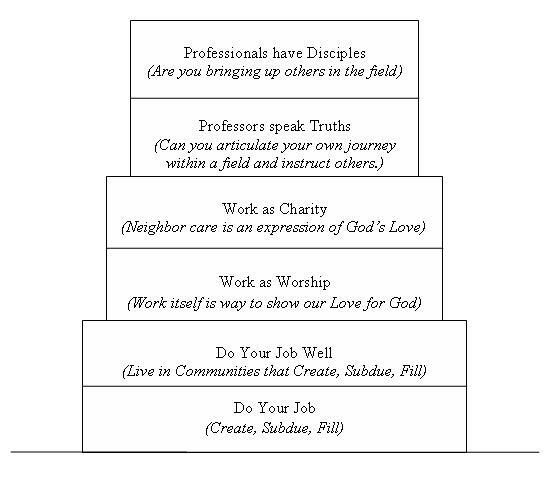 A fuller treatment of these ideas (along with activities and discussion questions) can be found in Professionals: Men and Women Partnering with the Trinity in Everyday Life. I hope these graphics and storyline have helped. My thinking is being transformed and more fully developed as well as I interact with all of you in considering these things.